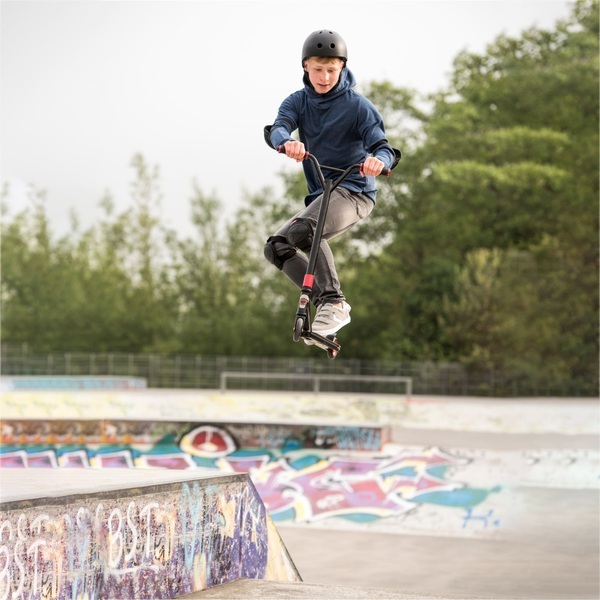 The Blindside 900 Stunt Scooter is designed for the skate park, perfect for performing daring tricks and stunts. Featuring a deck with deadly skull graphics in red and white, the Blindside 900 Stunt Scooter has been expertly designed to be an awesome ride. The handlebar grips, clamp and wheel trims add bold flashes of red to the black frame and look great with the cool graphics on the Blindside 900 Stunt Scooter’s deck. The 4 inch extrusion deck is designed to ensure the ultimate in strength and durability. The one piece pro style T bar gives you the control you need, as well as looking sleek and edgy. The T bar features rubber grips with ridges to give the rider a firm hold. The high quality steel alloy threaded fork is equipped with an aluminium triple clamp. This clamp is designed to improve the stability of the scooter and allow for a safe and steady ride. The 100mm PU wheels of the Blindside 900 Stunt Scooter are designed for bursts of speed. The wheels are enhanced by an alloycore and ABEC-7 bearings. Hop on the Blindside 900 Stunt Scooter for the coolest way to travel and perform your bravest stunts.